Dial gauge – No.VAS 6079. Dial gauge holder – No.T10170. Camshaft alignment tool – No.T10171. Camshaft/oil pump sprocket holding tool – No.T10172. Crankshaft locking tool – No.T10340. Crankshaft pulley holding tool – No.3415. Tensioner locking pin – No.T40011. NOTE: Mark direction of rotation on chains. Install dial gauge and holder in No.1 cylinder plug hole. Ensure engine at TDC on No.1 cylinder  . Ensure timing marks on camshafts aligned as shown. If not, turn crankshaft 360°  . Fit camshaft alignment tool  . NOTE: If camshaft alignment tool cannot be inserted valve timing is incorrect. 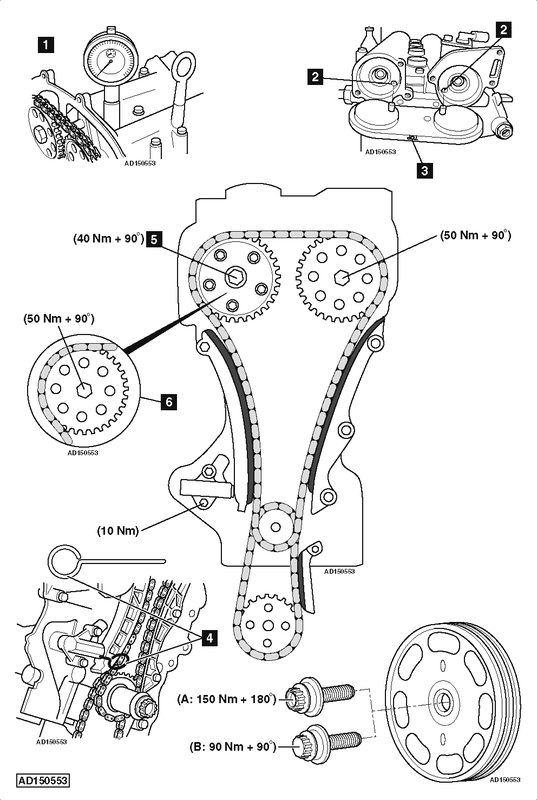 Compress timing chain tensioner and lock with locking pin  . Remove camshaft sprockets and chain. Align camshafts. Use special tool  . Install camshaft sprockets and timing chain. Fit new bolt. Tighten inlet camshaft adjuster bolt  . Tightening torque: 40 Nm + 90°. Tighten inlet camshaft sprocket bolt  . Tightening torque: 50 Nm + 90°. Tighten exhaust camshaft sprocket bolt. Tightening torque: 50 Nm + 90°. NOTE: Crankshaft pulley bolt and bolt on each camshaft sprocket MUST only be used once. Remove camshaft alignment tool. Turn crankshaft two turns clockwise. Car: 2010 1.6 vw polo trendline. I think my hyraulic tensioner needs to be replaced.In this particular car,the tensioner is bolted onto the engine inside the timing chain cover. I’d like to know if the removal of the crankshaft pulley bolt would disturb the car’s timing? I’m not sure if the timing chain’s crank sprocket has a lock which would help in keeping the car in timing. To some extent the information is helpful. However I am unable to find the Mark’s for timing on my polo 1.6 2013 model. Can you help as I unable to find camshaft alignment tool.